Zan, zamin, zar (women, land, gold), an old proverb that underlines the three things in the Punjab that bring the blood to boil. Add to the list a fourth — fluffy batura with fiery Pindi chole, sprinkled with a hint of pomegranate powder — especially if there is a long queue of hot-headed people jostling for it at Ambala Cantonment Junction, with only two minutes left for the Delhi-Amritsar Swarna Shatabdi to draw out. Wherever your travels in Punjab may take you — whether through the golden wheat fields-flanked Grand Trunk Road or the lesser country lanes that wind past sugarcane plantations and flat-roofed houses — this is a State you can eat your way through. So if it’s Ludhiana, you can’t leave without dunking your flaky naan in a handi of creamy, heart-clogging butter chicken. If it’s Ferozepur, you must try the crumbly canapés topped with olives and paneer tikka, and if it’s Amritsar, it has to be the steamy, layered paratha, eaten in sight of the Golden Temple. Much of this food draws inspiration from the hordes that conquered these lands, the dynasties that lent it their culture, the Punjabi diaspora’s new-found cuisine and their nostalgia for all things pind. I set off one morning from Kapurthala, a pretty provincial town in south-west Punjab, and stop for a cup of tea at the Kanjili Wetlands that stand at its fringes. The masala chai arrives in fine bone china — a legacy of Kapurthala’s princely past — giving off a heady aroma of spices and herbs. The half-ground pepper pods make me splutter, startling a common teal into flight, but I’m fortified for the journey ahead. Half an hour later, I’m at Sultanpur Lodhi, one of India’s oldest cities and home to Gurudwara Ber Sahib, one of Sikhism’s holiest shrines, built in the 19th Century by Maharaja Jagatjit Singh of Kapurthala. It was here in the 15th Century that Guru Nanak meditated for many years under a ber (Ziziphus jujube) tree. Huge cauldrons, with spoons the size of paddles, stand under its shade, filled with warm, sticky-sweet prasad made from butter, sugar and flour, served to all visitors. That, and the candied and smoked jujubes topped with onion fritters, see me through to Ferozepur. At this border town, I lunch at Harsh Vegetarian, Mall Road on Punjabi comfort food — aloo paratha, pachranga pickle floating in mustard oil and a bowl of thick curd, costing a little less than Rs. 100. It arrives in a huge steel platter and the restaurant is quiet despite the crowds; the only sounds are of people chomping through their meal and burping in satisfaction. Dessert is at a Marwari friend’s house — the phirni arrives chilled, saffron strands laid out in neat lines on a bed of well-ground rice, milk, cream and sugar. At the Indo-Pak border at Hussainiwala, 11 km away, where the lowering of flags is held every evening and a rose garden flourishes around the memorial where revolutionaries Bhagat Singh, Rajguru and Sukhdev were cremated, villagers hand out glasses of frothy lassi and bags of salted, roasted peanuts to visitors. Breakfast the next day, is at Tarn Taran, enroute to Amritsar. Once the hotbed of Sikh insurgency, the town today is filled with pilgrims heading to Tarn Taran Sahib, the gurudwara built by Guru Arjan Dev. Dhabas line the road, their simple plastic furniture and string cots little belying the wealth of flavours that emanate from a large vat where pooris are being fried a golden brown. Bowls of sizzling orange halwa and tangy chickpeas accompany it. After the green fields spinning off into the distance, Amritsar arrives in a cloud of heat, dust and flies. There are mandatory stopovers at all the places that fill our history books — Jallianwala Bagh, Golden Temple and the Wagah border. The best of Punjabi food can be found in the narrow bylanes in the old city full of bony cows dodging two-seater rickshaws, there’s even a place nicknamed Cholestrol Chowk. Shops sell a variety of papads and pickles at charming prices, there’s the dewy light shahi paneer at the 100-year-old Bharawan da Dhaba (there’s a more upmarket branch at the Alpha One Mall), Kesar da Dhaba’s dal makhani so soft that it’s creamy, the batter-coated, caraway seed-encrusted Amritsari fish at Makhan Fish and Chicken Corner and the sugar syrup-dipped whirls of delight at Gurudas Ram Jalebiwala. There’s just one ritual left to do before leaving Punjab and that is to buy gond besan pinni from Lovely Sweets, Jalandhar, for colleagues back home who threatened me with dire consequences if I were to forget. But before that, I succumb to the succulent murgh malai kebabs at The Brewmaster and top it up with a plate of big, fat and flaky samosas, filled with the trinity of Punjabi cooking — potato, onion and cumin — at a stall spilling over with people from the passport office nearby. When the sweetbox is opened in office, there are whoops of delight at the rows of pinni nestled like eggs. And then there’s silence as it crumbles in the mouth, only the roasted almond making a crunch. Everyone, including a visiting actor-model, reaches for another serving. 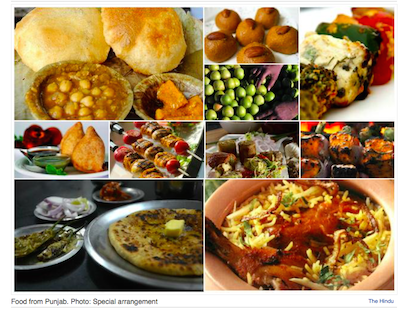 You can never have enough of Punjab da khana. How very very sad, such an article did NOT cease or pass the opportunity to malign the Sikhs by commenting “Once the hotbed of Sikh insurgency, the town today is filled with pilgrims heading to Tarn Taran Sahib”. The town has been the HOTBED of SIKH PILIGRIMAGE since it was founded.It is a centre of Sikh warmth and pietal righteousness. There never was a Sikh “insurgency”, but a desperate cry from the supressed people for their voices to be heard.There was mass a state terrorization and killing of people for simply being Sikh faith.In the end some people took to arms, was hardly an act of insurgency! I am surprised the so called ‘edictors’ did see nor caught, nore felt to purge such misleading lines and offending lines, to ensure such false messages were not passed on.